A very large group of Rochester players are participating in the 17th Annual Community Chess Club Championship. Round 1: Sam Cherin (front left) played a strong game, but lost to top-ranked chess expert David Petty. 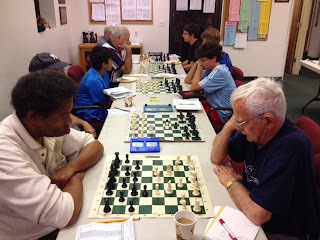 The tournament is being held from October 2 - October 23, 2013, in Rochester, New York at the Rochester Chess Center (221 Norris Drive). The tournament director is Ron Lohrman. There are 37 players participating. 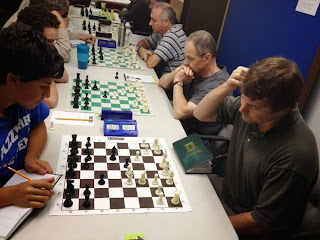 Round 1: Sherman Cunningham (left) won his game against Kenn Scullin. Games and photo gallery coming soon! Players: Please submit your games.